A graphene-azobenzene molecular switch. (a) Illustration of the molecular switch. (b) Reversible current modulation as a response to irradiation with different wavelengths of light (cycles of UV and visible light). (c) Showing how the structure of the azobenzene molecules alter on exposure to cycles of UV and visible light. By combining the unique properties of the one atom-thick sheets of carbon known as graphene with the precision of molecular chemistry, scientists from the Graphene Flagship have created light-responsive graphene-based molecular switches. As they report in a paper in Nature Communications, these switches could find use in applications such as photo sensors and even optically-controllable computer memory. The Graphene Flagship is a European initiative that promotes a collaborative approach to research with the aim of brining graphene and related nanomaterials out from the lab, through industry and into society. 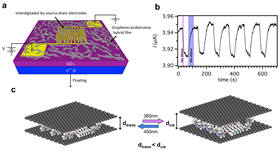 The multi-disciplinary nature of the work published in this paper, which was led by Paolo Samorì from the Université de Strasbourg & CNRS in France, was facilitated by the Flagship and its collaborative approach, in particular with Andrea Ferrari at the Cambridge Graphene Centre in the UK. As Samorì explains, “excelling in cross-disciplinary research requires a joint effort from a cohort of outstanding groups with complementary skills, and the EC Graphene Flagship project is the ideal platform to make this happen”. In the study, the scientists combined graphite powder with molecules capable of changing their structural conformation on exposure to light to produce concentrated graphene inks by liquid phase exfoliation. These graphene inks could then be used to make devices which, when exposed to UV and visible light, are capable of photo-switching current in a reversible fashion. As a demonstration of this approach, the scientists utilized a molecule known as 4-(decyloxy)azobenzene. Not only does this commercially-available alkoxy-substituted azobenzene have a high affinity for the basal plane of graphene, thereby hindering inter-flake stacking, but exposing it to UV light alters its structure, causing it to adopt a bulkier configuration. Importantly, this process can be reversed by simply exposing the sample to white light. Depositing this graphene–azobenzene hybrid ink onto a SiO2 substrate patterned with gold electrodes produced a light-modulated molecular switch that could be used to create optically-controlled computer memory. “This paper essentially gives an additional remote control to a graphene-based electrical device simply by the exposure to light at specific wavelengths,” says Samorì. “This is the first step towards the development of graphene-based multicomponent materials and their use for the fabrication of multifunctional devices – if you imagine a sandwich-like multi-layered structure with graphene sheets separated by multiple layers each one integrating a different functional molecular component. Each functional component therefore imparts a new stimuli-responsive character to the material which can respond to different independent inputs like light, magnetic field, electrochemical stimuli, etc, leading to a multi-responsive graphene-based nanocomposite”. "The Graphene Flagship was always about the combination of graphene and other materials to form new hybrid structures," said Ferrari, who is also the chair of the Flagship Management Panel. "This work is an interesting proof-of-principle of this concept and of the cross-disciplinary nature of the Flagship Research: chemistry, physics, engineering, fundamental science and optics, come together under the Flagship umbrella to develop new exciting device concepts". The heat transfer abilities of graphene nanoflakes can be enhanced by functionalizing them with amino-based and azide-based silane molecules.